Red76's Pop-Up Book Academy book-making station, FlatPak House. If you’ve wandered out to the FlatPak House in the Minneapolis Sculpture Garden anytime in the past two weeks you may have noticed a change of scenery in our pre-fab outpost. 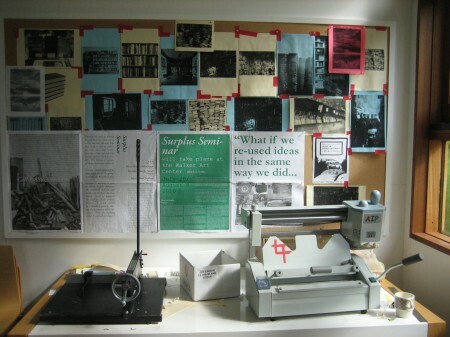 The house has been occupied by Open Field artists-in-residence Red76 as an office of sorts for their three-week project called Surplus Seminar. They’ve transformed the space into the Pop-Up Book Academy (PBA)–a bookstore, book-making workshop and discussion center. PBA is an ongoing project enacted by Red76 that takes all of these forms in different locations around the country. 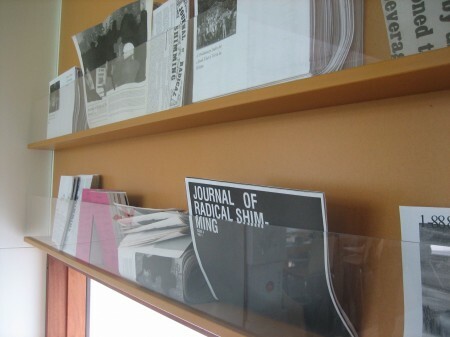 Editions of the Journal of Radical Shimming, free for the taking! 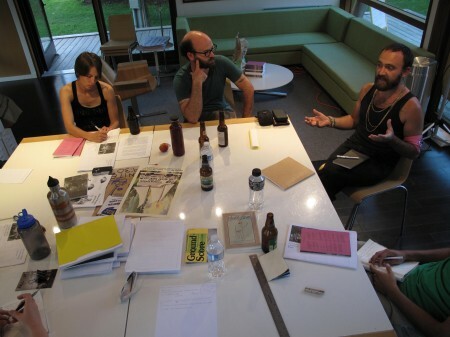 In the Minneapolis iteration, discussions based on print media take place every Wednesday and Friday night during the residency (through August 8). To start off the chain of events, visiting filmmaker Bill Daniel brought a pile of posters from DIY film screening venues around the country to launch the conversation on counter culture as pedagogy–PBA’s theme for the year. We’ve also heard from Gabriel Mindel Saloman on magical activism, Dan S. Wang on the books Paul Wellstone taught in his political theory classes at Carleton College, and Stephen Duncombe led a provocative discussion drawing on Thomas More’s classic text Utopia. 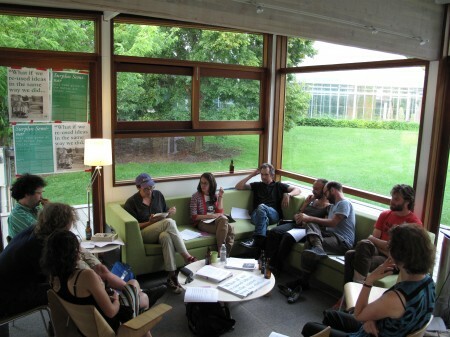 ***There are two PBA’s to come: Unsettling MN talks about the decolonization movement here in Minnesota on Wednesday, August 4 and artist/activist Aaron Hughes closes out the series on Friday, August 6 with a discussion about veteran’s war resistance movements. Gabriel Mindel Saloman talks about magickal activism.